I had never heard of Don’t Look Now before. I would usually have seen such films on lists or maybe recommendations from other film critics. However, for some reason I had literally never heard of this film before. Which compelled me even more to watch it. I sit down in my room and I turned off the lights. Grabbed my notepad and started the film. What happened in the next hour and fifty minutes was something I did not expect. I went through so many different emotions. From loving certain parts to absolutely hating others. From being nervous to laughing at loud at the silliness that is happening in front of my eyes. It was definitely an experience, however I’m not sure if it was a great one. 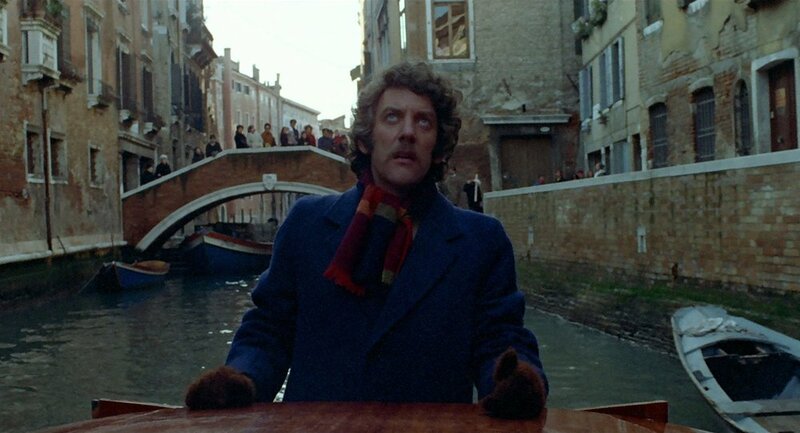 Don’t Look now is the type of film that I would have probably loved intensely if it were made in modern times. There is something about this film that just acts like such a huge crutch. One of the main aspects is the audio. For some reason it just felt awkward, or maybe the mixing wasn’t right. I thought initially that it was something wrong with the version of the film I was watching. But I later learned that it was just how it was made. The biggest example of this was during the church accident. When John Baxter is hanging on the piece of rope trying to swing to safety, I could not help but laugh. It was supposed to be a tense moment but the sounds were just so laughably awkward. The weird moaning throughout the whole ordeal felt really out of place and just killed my suspense. This was not the only instance of strange audio, but it was certainly the most memorable since it absolutely killed the mood. The film is not a bad one though. On the contrary, I could see how much thought and passion went into it. How everything fit so well. The film’s overarching theme has to do with skepticism, which is highly prevalent in British society. When Laura meets the two sisters and realizes their psychic abilities, she immediately gives in and believes. Whereas John is in denial throughout the whole film and this denial is what ultimately cost him his life. The film manages to also focus a lot on imagery to invoke that iconic scene at the start of the film. We see many close-ups of water throughout the film signifying the drowning of the daughter. As well, as a big emphasis on the color red. All of this added to the looming sense of dread that something else was going to happen. I can’t really talk about this film without discussing the ending, which in my opinion is one of the best and worst parts of the film. It is great because of the way they tied everything together. All of the questions that the viewers had in mind were answered in that final montage. Which I should say was really well edited. I also did not expect that John’s hallucination of his wife and the sisters was actually a foretelling of what is to come in his own funeral. I thought that was very clever. What I really did not enjoy from the ending was how predictable it was. Everything was building up to something, and just what I was expecting happened. Throughout the film there was constant mentioning of a killer on the loose in Venice. So it wasn’t surprising that the story ended with that killer murdering the main character. It was disappointing and I wished there was something more to the film. Overall, Don’t Look Now is a film with great intentions. A lot of care went into the making of the picture. Whether it be the careful attention to detail when it came to the cinematography or the extremely tight plot that was devoid of any unanswered questions. Furthermore, the film’s themes fit in very well with the story and was ultimately the main demise of the character. Even with all that, the film did not stand the test of time in my opinion. The strange audio, along with some really awkward acting just killed the film for me. A movie such as this should be able to maintain its tone and carry that feeling and build on it until the climax. What unfortunately happened was that this tone was disturbed by elements that were out of the film’s narrative. Which is a shame, because I feel like Don’t Look Now has the framework of an incredible film. For me however, it failed on key fronts.